BC-IC2 Crossover Mod 1.4.6 adds 4 electric engines, a oil materializer which produces oil from UU-matter, a generator that can run off of oil, fuel, or power from Build Craft’s conductive pipes. Note: All electric engines run best when they are blue; however, they will not explode if they overheat. There is still a penalty, it’s just not a crater where your engine used to be. They will still explode if you provide too high of an voltage. Diamond pipes, and diamond gears can now be crafted from industrial diamonds (not shown). Cools in the same manner a steam engine does, equivalent to a steam engine. Produces 1MJ/t. Accepts up to LV. Requires coolant, equivalent to a combustion engine burning oil. Produces 3MJ/t. Accepts up to MV. Requires coolant. Accepts up to MV. Produces 8MJ/t. Requires a fully powered dedicated pump, connected via gold waterproof pipe, or heat sinks to remain cool. Accepts up to HV. Produces 25MJ/t. Runs of off any fuel the combusion engine can use or power from BuildCraft’s conductive pipes. Turns off on redstone power. 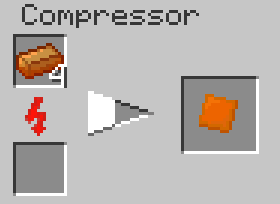 Produces 16 EU/t when running off of oil or power from BuildCraft’s conductive pipes; 32 EU/t when running of off fuel; providing a total of 64000 EU for oil and 256000 EU for fuel. Editable in the config file. Note: the conversion ratio is non-linear, how efficent a given fuel is, is determined by the total amount of energy that fuel produces per bucket. Produces oil from IC2‘s UU-matter. This requires a wooden waterproof pipe and an redstone engine to extract the oil from the machine. Produces 1 bucket of oil per ~14.4 UU-matter. Editable in the config file. Heat sinks provide a way to cool your engines with air instead of water. A heat sink will transfer heat from engines and to other heat sinks that are cooler than itself, and the atmosphere. The greater the temperature difference the greater the rate of transfer, this is very much not a linear function. Thus the hotter a heat sink is, the faster it cools, but the slower it transfers heat from a engine. This also means that lower tier engines are harder to keep cool as they have a lower maximum temperature. Each heat exchanger has a maximum amount of heat it can hold, and a maximum amount of heat it can transfer to/from neighboring blocks, this is called the thermal conductivity. These will work on stirling/stone and small electric engines. Has a thermal conductivity of 15 MJ worth of heat per tick. At maximum temperature it can cool ~1.42 MJ worth of heat a tick. The bronze heat sink has the lowest maximum temperature of all heat sinks. Has a thermal conductivity of 222 MJ worth of heat per tick. At maximum temperature it can cool ~7.3 MJ worth of heat a tick. The copper heat sink is noteworthy for its high thermal conductivity, making it a favorite for use in large heat sink arrays. What is better at cooling than copper? Really cold copper. The refrigerated heat sink can maintain a balmy -60 degress C with the application of a little EU. It can accept up to MV, and will cool 1 MJ worth of heat per every 2 EU. It can also run unpowered, but has a penatly to air cooling when doing so. Has a thermal conductivity of 222 MJ worth of heat per tick. At maximum temperature, and with 128 EU/t it can cool ~152 MJ worth of heat a tick. The refrigerated heat sink the highest maximum temperature of all heat sinks, as well as the highest rate of cooling, this makes it idealy suited for both the sink and source positions in a heat exchanger array. Install Buildcraft and IndustrialCraft2 following their instructions. Test to make sure BC and IC2 work. Place the BCIC2crossover zip into your mods folder in the minecraft directory. For multiplayer make sure you have the same block ID’s as the server. On the first run, this mod will create a cfg file in the /config/ directory of your minecraft folder, you can edit that manually if you have ID issues. By default this used block IDs 2210, 2211, 2212, 2213 and Item ID 31000. Fixed bug with temperature display going into the negative on some engines. Changed Oil Materializer default conversion ratio to 336, about 3 UU-matter per oil bucket. Config files will be updated.